Published in 1741, the Goldberg Variations earned its nickname due to Johann Gottlieb Goldberg (1717-1756) possibly being its first performer, although according to Bach’s earliest biographer, he would have been fourteen at the time of such a performance. Bach composed his Aria and Variations for, as the title page of the first edition clearly states, a double manual harpsichord, going on to state which specific variation required to be played with one hand on each manual, and I must say that this is still my favourite performing version. I have heard it performed in both of Dmitry Sitkovetsky’s arrangements, for String Trio and String Orchestra, and I have a few recordings of the work performed on a piano, but I find none of these as satisfying as the composer’s original intentions. For me, the most enjoyable arrangement is the one furthest away from Bach’s idea, that for Jazz Trio by Jacques Loussier, perhaps this is because it itself is a true elaboration of the work and not merely an arrangement or transcription. it was for this reason that I was interested in hearing this version by the musician and composer, François Meïmoun (b. 1979), for my favourite art form, the string quartet. The booklet tells us that François Meïmoun is no stranger to arranging Bach for string quartet, as he has already transcribed the Toccata BWV 913 for the medium, a work that the Quatuor Ardeo have also performed. 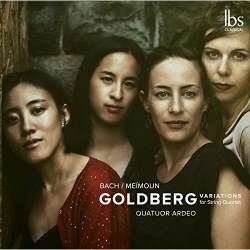 The Quatuor Ardeo state that at this time he professed an interest in arranging the Goldberg’s and that they encouraged him in his ambition to do so, with François Meïmoun finally finishing his quest in 2014, with the work receiving its premiere the following year. Meïmoun’s transcription is faithful to Bach’s original, with “no change to notes or rhythms”. It is, rather, than a work for string quartet, an orchestration of the piece for the four members of the quartet, who may not be playing simultaneously all the time. In this respect I believe that it is a better orchestration than Sitkovetsky’s, as I always found his version for string orchestra too heavy and overblown. In respect to Sitkovetsky’s string trio version, whilst it is a while since I last heard it, I find the extra member of the ensemble adds an extra dimension, a greater sonority without making for too big a sound. From the opening Aria, this is a well-crafted arrangement, one that still holds on to the original whilst not taking liberties; to say that this is a performing version that Bach would have approved of is daft, but I can imagine him enjoying it if he had had a chance. The polyphonic and contrapuntal writing of the original have not been sacrificed in this arrangement, something that Bach was a master of; if anything François Meïmoun has helped to bring this to the fore, this is an arrangement that I imagine listening to regularly. The performance is excellent throughout with the Quatuor Ardeo playing with a real sense of enjoyment. There are a couple of occasions when you feel that it is a little to closely miked, and you get some audible sniffing, in Variation 25, for instance, but for me, this does not detract from what is a very enjoyable disc. The booklet notes by the arranger and Quatuor Ardeo are good without dwelling on the work’s history. This is not just a disc for the curious, but one that all Bach fans should enjoy.